Whenever you seek advice in fields as varied as management, entrepreneurship, meditation, fitness, yoga, leadership, or diet, you’ll see the same buzz words: embrace change, balance, mindfulness, think out of the box, let go etc, etc. After almost every yoga practice you’ll hear “Namaste”, but many of us don’t really stop to think what this really means, and even less, how we can carry that meaning with us once we step off of the yoga mat. I have now pondered on this for a while, and I’ve come to realize certain things that you might find helpful in everyday life. Let me share these with you. To start off, let’s see what Namaste really means. This word is much more than a salutation used by Yoga hipsters, hot chicks and weed smokers. It is an actual, respectful, greeting from Hinduism that is widely used in Nepal, India, Bangladesh and other areas of Asia where the religion is practiced. To make things simple it means: I bow to the divine in you. 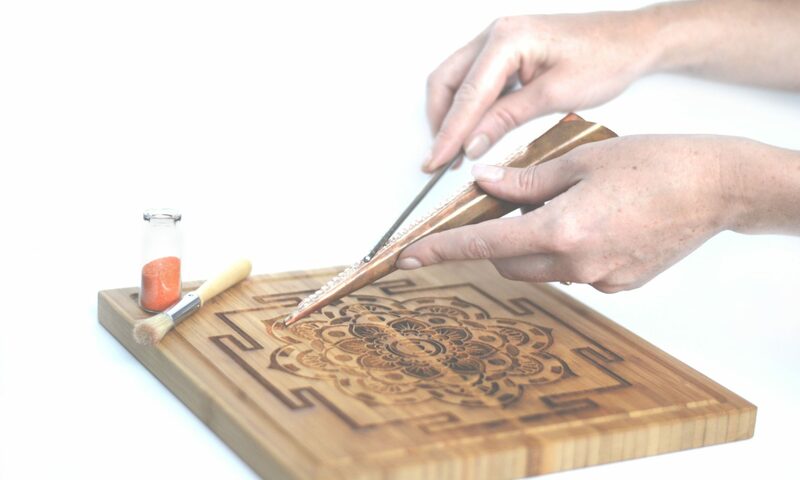 Get your sand mandala art meditation set straight from our Etsy store! Just click here and start experiencing a whole new way to meditate! In Hinduism (as well as in other religions, by the way), it is believed that God is present everywhere; in every being – animal or human, good or bad. So, by that they mean ‘I respect you and revere to the God that is in you’. Keeping this in mind, I started accidentally understanding the meaning of balance, the importance of letting go and the power of “namaste”. I used it, at first, to remind myself to practice mindfulness. Like many of you, I have a family, a job, and in parallel, I am starting a business. All of that adds pressure, or the impression of stress. Well, now imagine that you went to the gym, practiced your yoga and ate properly for the whole day. You’d feel great and would want to get the same feeling the day after. Unfortunately for me, the next day came and I was told, with very late notice, that I had to give a presentation during one of our business meetings – scheduled to take place in about two hours. I asked for supporting materials and received super long documents full of graphics and populated with way too many lines. I understand the material, but how can I transmit the right message to my audience, and keep them engaged in the solution we were looking for? Just 10 minutes before starting, my head was clouded with ideas. It was Friday, I was tired, and it was the last day the VP was going to be in our office before heading back to the European branch. What came to my mind, at that point, was: Namaste Mother F**ker. So, I just went to the kitchen, prepared a nice espresso with a lot of care and delicacy, exactly how I liked it – and decided to enjoy my coffee. Yes, I was unsettled and kind of furious; but I had to keep my professional attitude and my good reputation. The relief in their faces was incredible. The meeting was light, pleasant, and the takeaways were memorable. That all happened because I thought: “Namaste Mother f**ker”. In my case, mentally screaming “NAMASTE MOTHER F**KER!!! !” has resolved a lot of superficial problems during my day. It has allowed me to focus on what’s important and, more importantly, communicate my wants and needs more clearly to others while also listening to theirs in a mindful manner. When you are driving and the driver on the side cuts in front of you, a good “namaste mother f**cker” was key in relieving the tension – often through laughter. I’ve learned to see a situation, acknowledge it, and if necessary react with the expression. This allows me to continue my way without giving it the power of controlling my next reaction or my mood. Try it. Scream it in the car (make sure your windows are closed though!) and let me know how it feels….